In the early 1900s, guests at the California Alligator Farm were encouraged to enter the pens and play with the gators. Long before Steve Irwin made a name for himself as the Crocodile Hunter, a small reptile-themed industry was blooming in the sunny Lincoln Heights neighborhood of Los Angeles, California. 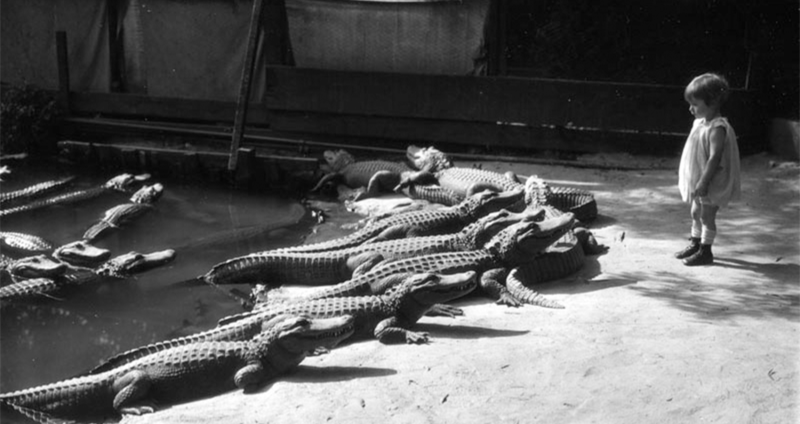 The California Alligator Farm, which opened in 1907 and operated until 1953, was home to more than 1,000 gators, from babies to full grown adults. 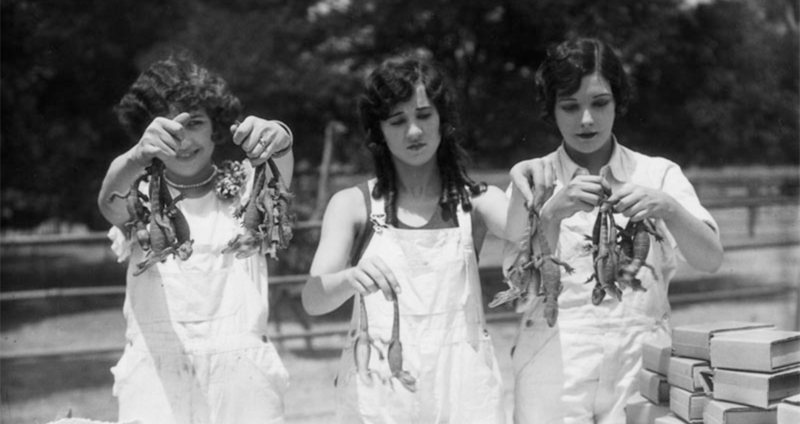 There were 20 ponds at the park, in which the gators lived and performed daily shows for crowds. However, this was no ordinary zoo. The main attraction of the park was the ability to interact with the gators, some of whom reached 15 feet in length. 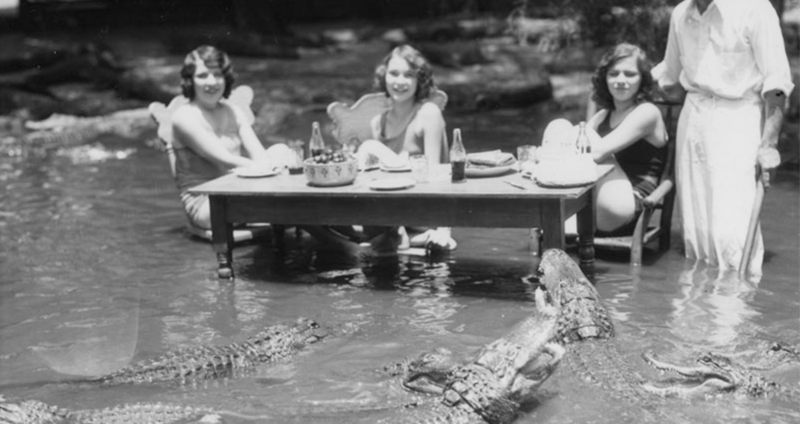 Though there were signs warning visitors not to “throw stones at the alligators, spit on, punch or molest them in any way,” guests were allowed, and even encouraged, to enter the pens and play with the alligators. They could even bring their pets to the park. Given what we know about the nature of alligators now, the thought of people handling them freely is truly terrifying. For an admission fee of 25 cents, kids could sit in piles of baby alligators, letting them crawl across their legs. They could also enjoy alligator rides, where children could sit in a specially made saddle and ride the gators around in the ponds. Adults would often be seen petting, laying on the ground, or even swimming with fully grown alligators, seemingly oblivious to their imminent danger. 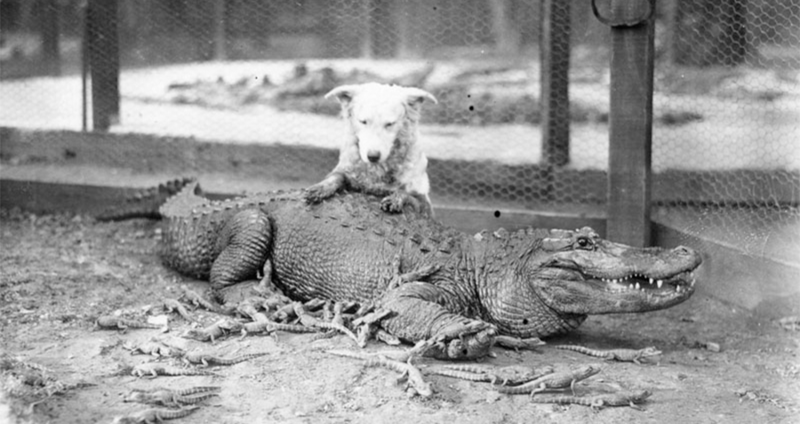 They would also attend shows where the alligators would be made to ride down slides, feed on live chickens, and wrestle with human volunteers. 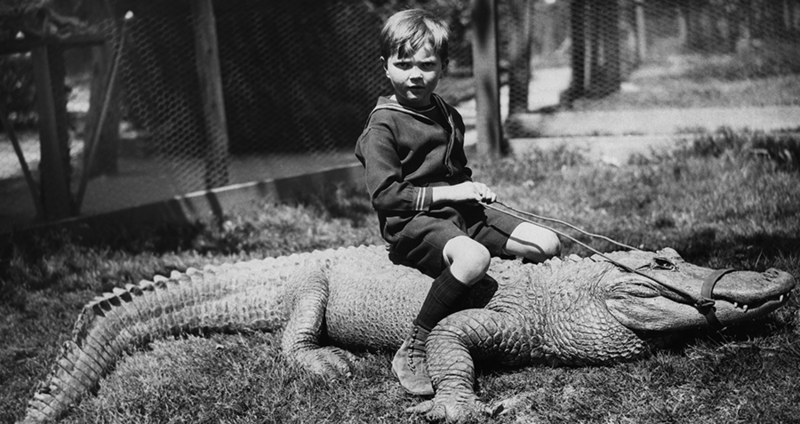 Getty ImagesA boy rides an alligator. There was also a California Alligator Farm gift shop, where park-goers could purchase trinkets made from alligator skin. Some of the park goers even purchased their own baby alligator to take home with them. The early 1900s were a weird time. The farm was run by “Alligator Joe” Campbell and Francis Earnest, who oversaw the capture, breeding, and exercise of their reptilian residents. An article, written about the park in 1910, described the inner workings of the park. For the most part, the gators at the California Alligator Farm were bred in captivity, though there were a few initial captures made. After that, Campbell and Earnest started incubating their own eggs, and breeding baby alligators. However, the novelty of the alligator farm dwindled, and visitors stopped coming. It was eventually moved to Buena Vista, California, and then Florida. Though the days of uninhibited alligator play are over, there are still attractions that feature alligator shows and close encounters with the reptiles. Today, the St. Augustine Alligator Farm and Zoological Park is still up and running, though with not nearly as much reckless alligator handling. It currently holds the world’s largest collection of alligators and crocodiles. They also have at least one of every species of crocodilian in the world– all of whom, thankfully, remain enclosed in their pens full time. Enjoy this article on the California Alligator Farm? Next, check out this photo gallery of pictures from alligator farms across the country. Then, watch this video of a giant alligator that’s actually super real.